Choosing the music to accompany your wedding ceremony, or to be played at your wedding breakfast or reception will undoubtedly take up a large part of your wedding planning. Finding the right harpist to suit your tastes and needs can appear to be a relentless task, but by researching your options and finding out availability early on, the whole process can be made less daunting! Music plays such an enormous part in the whole wedding ambience and whether you are choosing that certain piece to accompany the bridal party's arrival at the church, or seeking out an individual singer or musician for the whole event, you need to research and plan thoroughly! Harpists will be in huge demand at peak wedding points in the year - late spring and summer and over the pre-Christmas period. Bear in mind too, that their services will be called upon for other events; corporate dinners, Christmas parties and graduation ceremonies - with that in mind, make your enquiries as far in advance as you can, and get your chosen performer booked and confirmed as far ahead of your wedding as possible. Many harpists who specialise in wedding ceremony and reception gigs will advertise their services through the bridal magazines, or leave their business cards and contact details with other pertinent wedding suppliers, so if you are having trouble sourcing a player, ask around bridal shops, florists and wedding car hire outlets - they will be sure to have a contact they can put you in touch with. There are several online directories of harpists who specialise in weddings and corporate events, many of whom have their own websites and even sound clips so you can hear what they have to offer - but always satisfy yourself that you know what exactly what you are booking if you make your arrangements solely via the web and without any face to face contact! If you are on a budget and all the quoted prices seem out of your price range, consider asking at your local college or music school - many students make pin money by playing at events, and, assuming you hear them play in advance and are happy with the quality of their performance, can be an excellent way to secure your harpist on a budget, and give good practical experience to a young performer. 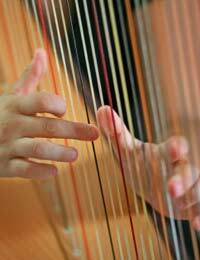 Your chosen harpist will probably have a range of set pieces they play at functions - but ask what their wedding repartee is, and always try to hear a CD of their work - or see them for yourself - before confirming your booking. Do not be afraid of asking for references and following them up - likewise, if you do not like what you hear or you are not convinced by someone's ability to perform in front of a large group of people, do not be worried about looking around elsewhere. Like every other aspect of your wedding - particularly where third parties are concerned - you must be one hundred per cent happy and gel with your performer, else you will spend your big day worrying about how it is all going to pan out!